With the holidays here and the temperatures finally cooling, it’s officially time to rock that winter wardrobe and get into the holiday spirit. 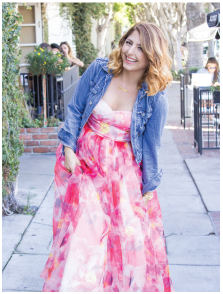 But, if you are like some of my clients, transitioning into holiday wear can actually feel overwhelming! Where to start? What are the important trends? How to stay warm and stylish? And most importantly, how to stay cozy without adding bulk to your frame? With so much to consider, winter style can be a challenge, but I’m going to break down my five easy holiday styling tips to make getting dressed this winter simple, easy and way more fun. 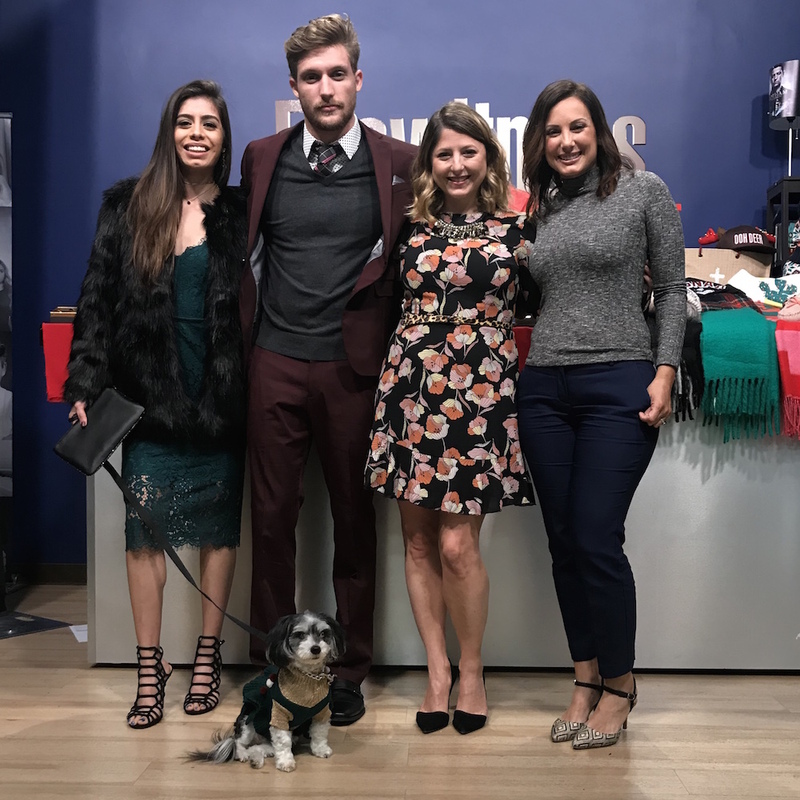 Having just styled a holiday outfit TV segment with Bakersfield Now for the Outlets at Tejon, I’ve got these tips fresh in my mind and I’m so excited to share them with you. It’s always been my mission as a stylist to offer a more educational experience with wardrobe. 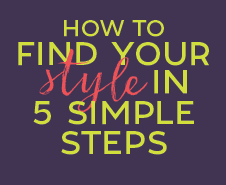 Because when you learn the tools and tricks of style, getting dressed becomes more inspired, more creative and easier! This is especially good if you have a busy morning routine and minimal time to think about your wardrobe. And just think: the more you practice your own personal art of style, the easier it becomes! So let’s get started. 1. Layers are your best friend. We’ve all heard about layering to stay warm in the winter and it truly is the perfect trick that I stand by every winter season. But for 2018 it’s all about creative layering. Boring is so 2000-late! Your winter fashion should be fun, colorful and creative. For girls, try laying a long sleeve stripe shirt with a warm flannel button down. Layer another jacket over that, too! The secret is to have all your layer hems hit at different points on your frame. Your base layer can be half tucked into your pants, your button-down can hang long and your top jacket can fit cropped. This creates dimension and visual interest in your look. For the boys, look to sweaters over your flannels and then a puffer vest over that. The puffer vest is on trend for the season and does just the trick to keep your frame warm overall (which is key in the colder months). The details matter here, too! Pull your button-down cuffs out from your sweater to show a pop of color or pattern, and don’t forget to pull out your collar. The pop of contrast will frame your face. Want added warmth? Look into layering pieces from Columbia with their patented Omni-Heat technology. It’s breathable fabric that keeps the body temperature warm in cooler weather. One of my favorite things to do as a child was to flip through the LL Bean catalog and say out loud all of the color options for each item they sold. And each time I always gravitated toward one section: the plaid shirts. I loved reading all the different names—Royal Stewart, Hunting Stewart, Dress Gordon, Black Watch, just to name a few. To me these tartan plaids really make winter feel like winter. Especially when they come in cozy flannels, too. The colors are perfect for holiday, playing with reds, whites and hunter greens, but they also style perfectly with all your winter neutrals. Because plaids have so many different colors in them, you can get really creative with how you style them—rom print mixing with classic stripes, to creatively styling with contrasting colors. So for the holidays, add plaid! It’s really that simple! Plus the best part is that this is timeless. That means you can invest now and wear every winter season after. When I think of the holidays I always visualize wine reds, hunter greens, textural fabrics like velvet and furs, pattern play with plaids and, of course, a touch of sparkle. So why not style with the season in mind?! It’s so easy during the cooler months and the darker days to go dark with your wardrobe. But styling with dark colors doesn’t mean you have to wear black! Styling with seasonal colors and details add a punch and spirit to your look. Plus it puts out that holiday energy into the world! Just think: if you’re outfit makes somebody smile, then you’ve already spread holiday cheer! So think of getting festive with your look as just another way to spread positive energy, smiles and inspiration during the holiday season. 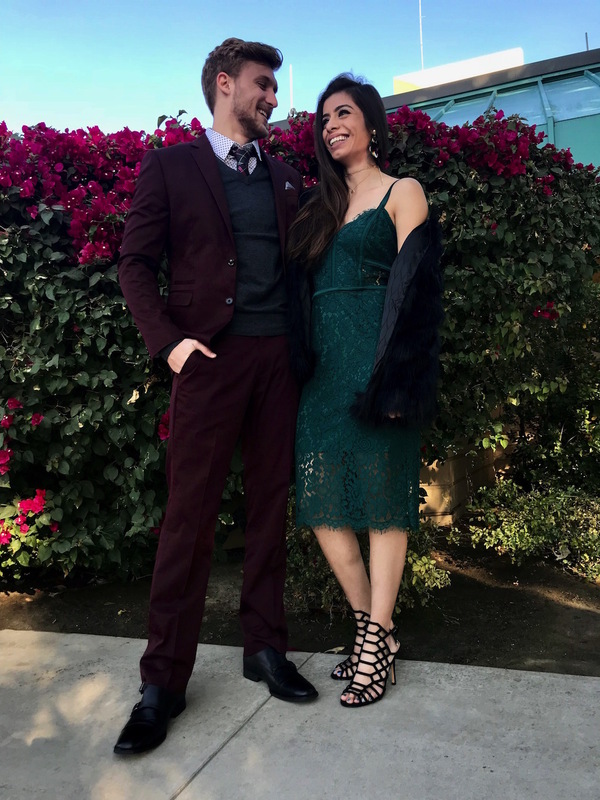 Pick up that green lace dress, or go bold in a wine red suit. The bottom line is have fun! One aspect of style so many people forget to acknowledge is accessories! They truly make the outfit. They are the topping pieces to your look that add personality, excitement and can grab attention—in a good way. For women, opt for styling with a sparkling statement necklace, a bold bangle or an eye-catching pair of earrings. For men, why not add in a plaid tie, a pop of color pocket square, or even a patterned sock? That’s always a detail that shows your attention to detail as well as your creativity. (And for you single men out there, women love that!) Plus, great accessories can be a conversation starter, whether at a holiday party, a networking event, or even just shopping at the supermarket. Pop on something that is eye-catching and let your outfit speak for you. You never know who you may meet or run into… especially during the holidays, when there is magic in the air. Style shouldn’t be intimidating, though so many people feel that it is. But for the holiday season, spread some of your own closet cheer for yourself and your partner. Have fun with your style! Don’t be afraid to try something new. Don’t stop yourself from wearing something sparkling, just because. Treat yourself to that outrageous faux fur jacket, or those high heel shoes. Whatever it is for you—go for it! I even give you permission to break your own rules! So many times, it’s us stopping ourselves from trying that new daring item or wearing something a bit more bold. So I ask you: what kind of fun would you have with your style if you didn’t stop yourself? Treat your self to some of that love and acceptance this season and the inner positive energy and style will shine through any outfit you wear. All the fashions you see are from the stores at the Outlets at Tejon. 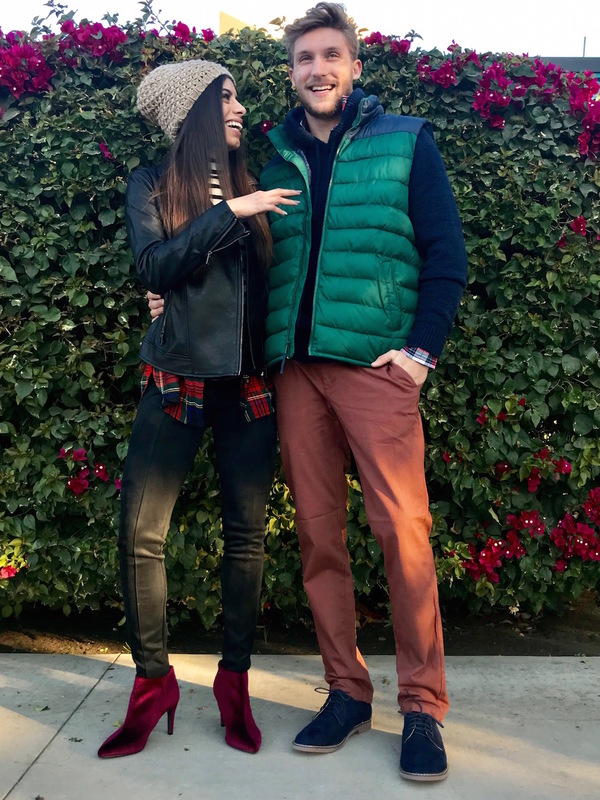 Our casual layered plaid looks are head to toe from Old Navy Factory Store. 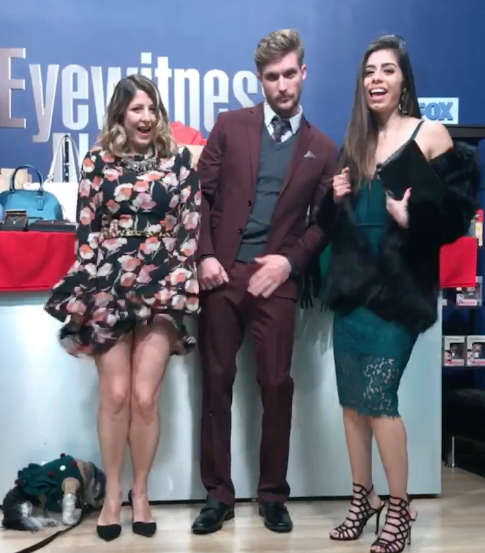 And our dressed up looks are from Express Outlet (men’s look, green dress & cage heels) and H&M (the fur jacket & jewelry). A big thank you to my amazing models, Stephanie and Matt in Bakersfield, for being such rockstars on set every time we shoot. To the Outlets at Tejon for giving me the opportunity to live my dream life and work at my dream job as their Style Ambassador, and to Erin Briscoe, Josh Damien and the teams at Bakersfield Now for having us on camera all year! I cannot wait to see what 2018 has to bring!